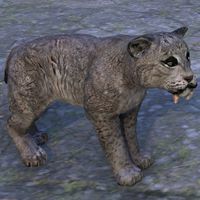 Sabre Cats are mighty and majestic hunters that rule the northern plains and tundra by sheer strength and savagery—but, Daedra take it, they sure are cute when they're cubs! The Sabre Cat Cub is a pet available in the Scalecaller Crown Crates as a Legendary-level reward. Its default name is "Li'l Bitey". "For the Mages Guild, I devised an enchanted 'appealometer' that measures creatures' adorableness," says Researcher Neotenus. "After tests on other pets, I tried to take a reading on a Sabre Snow Leopard Cub, but the device overloaded and shattered." The Sabre Leopard Cub is an upcoming pet that has yet to be available. Its default name is "Toofums". A goat bred to take part in Daedric rituals? Nonsense. It's just a goat. Isn't it? But why does it look at you like that? And did it just … whisper? No. It's just a goat! 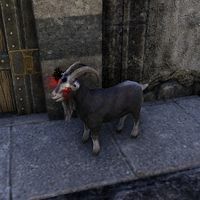 Sanguine's Black Goat is a black and white goat available from the Crown Store for 400 . Its eyes will occasionally glow red. Its default name is "Whisper". The Dovah-Fly is a common sight in the oil-slick ravines of the Clockwork City. While its ornate clockworks are a wonder to behold, it's hard to shake the feeling that it's always watching you. 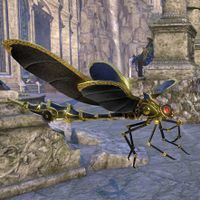 The Scintillant Dovah-Fly is the loyalty reward for the Clockwork City DLC. 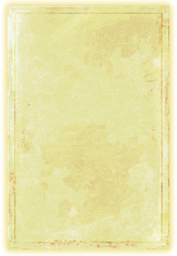 It can be earned by entering the Brass Fortress. Its default name is "Skimmer". 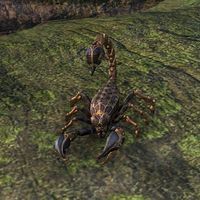 "Since our Incarnatoriums can be modified to produce Fabricants modeled on almost any creature of Tamriel Above, why are Scorpion Fabricants of differing sizes so popular? They're our most-requested fabs!" says Clockwork Apostle Dringest. The Scorpion Fabricant is available in the Flame Atronach Crown Crates as an Legendary-level reward. Its default name is "Stinger". Hardy and good-natured, the faithful Skyrim Paint Pony wants to be near its master regardless of the weather, leaning into the wind even in a tundra blizzard. 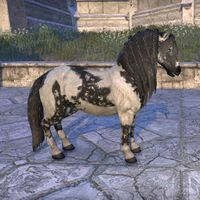 The Scruffy Skyrim Paint Pony is an upcoming pet. Its default name is "Ponytail". These are clearly fabricants, clockwork simulations of living creatures, with the distinctive appearance of the handiwork of Sotha Sil. But if so, how did they escape Clockwork City? What powers them? And why do they make such loyal pets? No one knows. 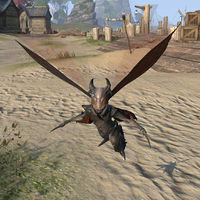 Seht's Dovah-Fly was available from the Crown Store for 010001000 for a limited time, then from Dragonscale Crown Crates as a Legendary-reward. Its default name is "Wirewing". The Senchal Striped is a cat that is as cunning as it is elegant. It's both cursed at and admired for its ability to get into places it doesn't belong. 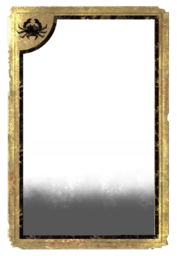 The Senchal Striped Cat was available in Hollowjack Crown Crates as a Superior-level reward. Its default name is "Sangiin". 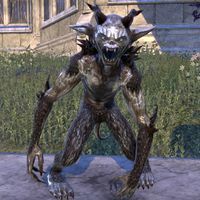 This ominous yet playful pet, conjured by Psijic magic in shape of a glowing Senche Cub, represents an Artaeum monk's regrettable choices that may yet be reversed by proper adherence to the Old Ways. 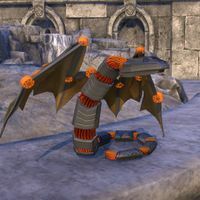 The Senche Cub of Scarlet Regret is available in the Ouroboros Crates as a Legendary-level reward. Its default name is "Crimson Cat". True, it does hiss rather than meow, and has shiny scales rather than soft fur, but otherwise the Senche-Lizard Cub is just as adorable as any other kitten. The Senche-Lizard Cub is an upcoming pet. Its default name is "Kitty Lizard". 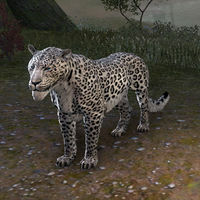 The Senche-Leopard is one of the most feared predators of the Tenmar Forest in central Elsweyr, but if one of its adorable cubs can be adopted when young, it makes a fiercely-loyal companion. The Senche-Leopard Cub is a young spotted leopard. It is found in Flame Atronach crates as a Legendary-level reward. Its default name is "Motley". If you domesticate a Senche-Lion Cub when it's young enough, it will follow you everywhere, no matter how dangerous. And your enemies will burn from the cuteness. 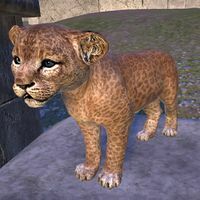 Senche-Lion Cubs are young lions that can be purchased from the Crown Store for 700 . Its default name is "Kitty Claws". It's a striped Senche-Tiger Cub. What more could you need to know? "Ah," you ask, "but is it magical?" Just look in those eyes for your answer. 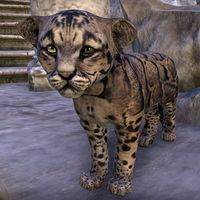 The Senche-Tiger Cub is a pet available in the Scalecaller Crown Crates as a Legendary-level reward. Its default name is "Spot". These flying vipers have short tempers and nasty dispositions, but just look at those cute crimson eyes! Some of them can even be trained not to inject poison when they bite. The perfect pet! 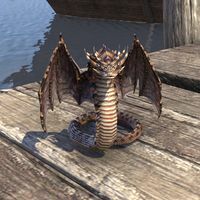 Sep adders were available from the Crown Store until July 17 2018, for 700 . Its default name is "Scaly Death". Rarely seen outside the ash clouds of Vvardenfell's great volcano, the little Shadowghost pony guar is scary cute. 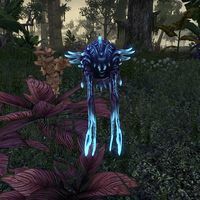 The Shadowghost Guar is available in the Reaper's Harvest Crown Crates as an Epic-level reward. Its default name is "Shyscales". Unlike their lone cousins, the great Shadowghost Wolf Mounts, the smaller Shadowghost Pack Wolves hunt on the darkest nights in howling groups. Separated from their packs, they make loyal companions. The Shadowghost Pack Wolf is available in the Reaper's Harvest Crown Crates as an Epic-level reward. Its default name is "Mist Howler". It's said that to catch a Shadowghost Pony, one should seek out a cemetery on a dark night during Witches Festival and wait quietly near the grave of a child. Bring a carrot or sweet apple. Shadowghost Ponies were available from the Crown Store from October 5 to October 9, 2017 for 700 . Its default name is "Misty Princess". In Elsweyr, being seen in the company of an uncanny Shadowghost Senche-Panther will put one under suspicion of being a Namiira cultist - or even a disguised dro-m'Athra. 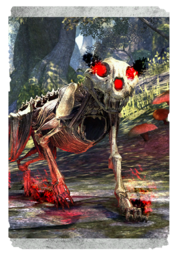 The Shadowghost Senche-Panther is available in the Reaper's Harvest Crown Crates as an Epic-level reward. Its default name is "Nightpouncer". No one can look at the glistening plumage of the Shimmering Indrik and doubt its enchanted nature, for it sparkles with Magicka and virtue. Here is a creature untainted by aggression, though it will ably defend itself at need. The Shimmering Indrik is going to be available during the fifth week of the 5th Anniversary Jubilee from The Impresario for Event Tickets 0000000 . Its default name is "Night Light". The lumbering great Salamanders of southern Tamriel all defend themselves with bursts of elemental power, but the Shock Skin variety specializes in electrical discharges. Fortunately, they can be trained not to zap their masters! The Shock Skin Salamander is an upcoming pet. Its default name is "Zapnewt". 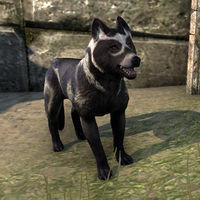 Shornhelm Shepherds are black-colored dog pets available from the Crown Store for 400 , and in the Storm Atronach Crown Crates as a Superior-level reward. Its default name is "Hackles". The werewolf hunters of the Silver Dawn rely on the courage and keen noses of these great High Rock hounds to help them track Tamriel's lycanthropes to their lairs. Silver Daenian Werewolf Trackers are Daenian Hounds bred with white fur and black spots. It was available from the Crown Store for 1200 , and with the Wolfhunter Collectors' Pack. It was available from the time the Wolfhunter DLC came out until Murkmire's release. Its default name is "Wolfhunter". Knights of the Spider Cult, known as Deathweavers, often disdain the cultists' usual Daedric Spider companions, preferring Skein Scorpions to present a more warlike attitude..
skein scorpions were available from the Psjiic crown crate season. Its default name is "Stingaree". The giant crimson beetles that scuttle through the gloom of Mephala's Spiral Skein are said to use their pointed probosces to drink the blood of whatever they catch. 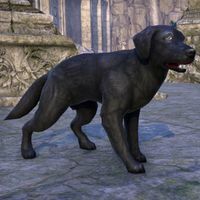 True or not, it's a fine gruesome story for cultists to tell about their Daedric pets. skein shalks were available from the Psjiic crown crate season. Its default name is "Bloodbug". It should surprise no one familiar with Mephala the Webspinner that spiders are among the most common denizens of the Spiral Skein, the Daedric Prince's Oblivion realm. They're not exactly affectionate pets, but they are fiercely loyal..
skein spiders were available from the Psjiic crown crate season. Its default name is "Skittery". 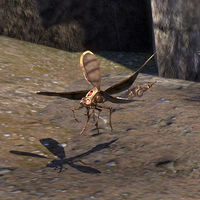 When Mephala populated the Spiral Skein with "improved" versions of Tamrielic invertebrates, she outdid herself with the Skein Wasp, a giant menacing insect guaranteed to give any mortal the shivers!. Skein was available from the psjiic crown crate season. Its default name is "Probosky". When the Two Moons are full, the undead wolf pack rises from the grave, point their canine craniums at the sky, and try to howl—but the only sound is a dismal rattling in their bony throats. The Skeletal Pack Wolf is an upcoming pet that has yet to become obtainable. Its default name is "Bone Howler". Shouldn't an animated skeleton always be a thing of fear and revulsion? This necromantic Pony Guar might change your mind about that! 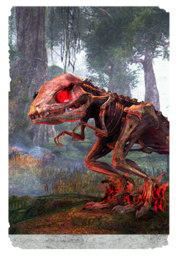 The Skeletal Pony Guar is an upcoming pet that has yet to be available. Its default name is "Bluebelly". Is Necromancy always wrong? Not even death can stop this loyal Senche-Leopard from stalking to adventure at your side! The Skeletal Senche-Leopard is an upcoming pet that has yet to be available. Its default name is "Spotless". This construct resembles a great and fearsome Bone Dragon, but it's actually a product of the Necromancer's art, assembled from modern bird and reptile bones and then reanimated. The Small Bone Dragon Construct is a small reanimated skeleton in the shape of a dragon that is available as part of the Dragon Bones Collector's Bundle. Its default name is "Rattlewing". The Snow Bear is known for its fierceness, but its cub is as cute as a bug. Maybe even two bugs. 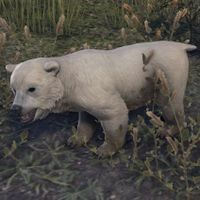 Snow Bear Cub pets were previously available from the Crown Store for 010001,000 . Its default name is "Sugarfur". This little cub loves to play in the snow, but don't let it get lost in the deep drifts—and when you pull it out, be careful of those little sabre teeth! 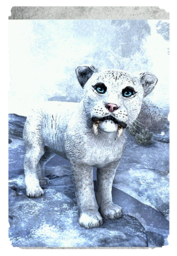 The Snowy Sabre Cat Cub is an upcoming pet that has yet to be available. Its default name is "Cotton Fluff". This extremely rare Dwarven Spider model is surmounted with a double golden crescent, interpreted by scholars of the Dwemer as a "Solar Arc," or tribute to the sun—an iconography otherwise completely unknown among the handiworks of the Deep Elves. The Solar Arc Dwarven Spider is an upcoming pet. Its default name is "Sunnylegs". Even for the elusive Senche-Leopard, the Spotted Snow is a rare variety. Despite its frosty-looking fur, this adorable companion makes for a great cuddle buddy during long winter nights. 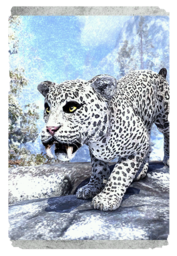 The Spotted Snow Senche-Leopard was available in the Crown Store from January 4, 2018, until (?). Its default name is "Frostfur". For mortals good in heart and soul, being in the presence of a Springtide Indrik induces serenity and makes anger almost impossible—though paradoxically it also inspires a righteous determination to fight injustice. Springtide Indriks are Indrik fawns that resemble the Dawnwood Indrik in appearance. They were available from The Impresario for 000001010  during the 2019 Jester's Festival. Its default name is "Heartsease". With soul gems in short supply, the Clockwork Apostles invented this experimental Brassilisk powered by steam stored under high pressure. 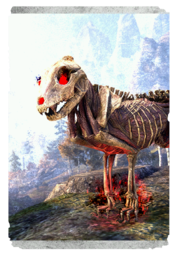 The Steam-Driven Brassilisk is a brassilisk pet formerly available exclusively from the Crown Store for free to PC/Mac players between November 7 and January 2, 2018. Its default name is "Pressure Valve". It is a reference to Steam, the gaming software owned by Valve Corporation that distributes the game on computer platforms. 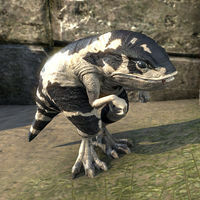 A favorite household pet in Morrowind, the Striated Pony Guar is a glutton for affection. 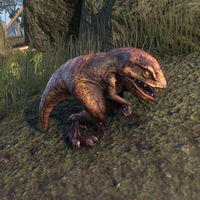 Striated Pony Guar were originally available from the Crown Store for 400 . Its default name is "Wobble". The elegant senche-panther is a distant relative of the Khajiit, though it cannot speak like the cat-folk. Striped Senche-Panthers are black Senche with purple stripes and red eyes. They were available from the Crown Store for 00700700 until April 3rd, 2019. Its default name is "Indigo". 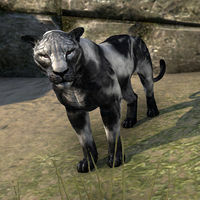 Striped Senche-Panthers are popular mascots of the Baandari Pedlars of Elsweyr. Incredibly adorable as cubs, even when small they can be trained like magpies to fetch shiny things back to their masters. 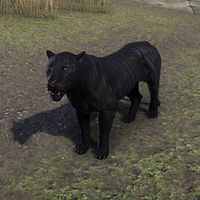 The Striped Senche-Panther Cub is available in the Crown Store as part of the Starter Pack, which can be bought for 00500500 . Its default name is "Inky". This gibbering, foul-smelling Daedric minion will follow you loyally, though it won't fight for you. 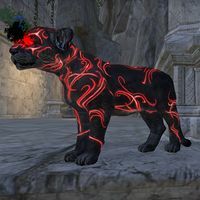 A Stonefire Scamp pet can potentially be earned by completing the Barathrum Centrata event in the Imperial Sewers, as part of the Imperial City DLC. It is a very rare drop of the event's final boss, the Simulacrum of Molag Bal. Its default name is "Brimstone". Though obviously related to the netches of northeast Tamriel, the swamp jellies of southern Black Marsh also have a disquieting resemblance to aquatic jellyfish. Natural philosophers have no adequate explanation for this. Swamp Jelly is an aquatic netch-like pet acquired by collecting seven runebox fragments from Cyrodilic Collections daily jobs in Stormhold. Its default name is "Marsh Gas". Once a common sight in Cyrodiil's Great Forest, the Sylvan Nixad is now most often encountered in the glades and meadows of the Gold Coast. Once tamed, they make charming companions, loyal and easy to care for. Sylvan Nixads are gray pixie-like creatures with red wings. They were available from the Crown Store for 700 and can currently be found in Psijic Vault Crates as a Superior-level reward. Its default name is "Crimson Dancer". This page was last modified on 3 April 2019, at 18:29.